The gap at the top of the Sussex Premier League closed to 11 points as Preston Nomads were held to a draw by Middleton and second-placed Roffey beat Billingshurst. Aaron Philips hit 94 as Nomads made 253-7 declared. 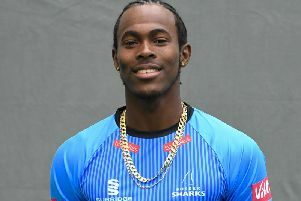 Jofra Archer took 3-69 for Middleton. In reply, Middleton lost Sean Heather in the first over to Carl Simon (4-60). But Middleton fought back and managed tom hold on for the draw at 213-9 despite Simon’s and Stephen Rigg’s (4-78) best efforts. George Fleming took 6-73 as Roffey bowled Billingshurst out for 202. Sussex’s Chris Liddle (42) hit four sixes as he top scored for Billingshurst. In reply, opener Theodore Rivers (53) got Hurst off to a good start but Ben Williams (4-49) pegged Roffey back. But the reigning champions managed to get home with two wickets to spare. Ben Shoare (133) and Thomas Haines (101*) both hit centuries for Horsham as they drew with Cuckfield. Horsham totalled 284-5 before Cuckfield held on at 207-7 at the end. Chris Mole (72) and Roston Chase (51) toop scoored for Cuckfield. Michael Munday was in the wickets again, taking 4-72. Bexhill enjoyed a 37-run win over East Grinstead. Bexhill batted first and scored 218-9 before they bowled Grinstead out for 181. Shawn Johnson (70) and Callum Guest (6-60) were the stars for Bexhill. In Division, Hastings are top after their win 79-run win over Findon. Elliot Hooper was the star of the show hitting 142 before taking 5-58. Crowhurst Park are still bottom after they lost to Ansty by eight wickets. Jethro Menzies took 5-28 as Crowhurst were bowled out for 142. Grove Venter hit an unbeaten 81 in Ansty’s reply. Lindfield put in a good team performance as they beat Ifield by 36 runs. Lindfield scored 195-5 before bowling Ifield out for 159. Joe Ludlow (111) and Brad Gayler (72) helped Three Bridges post 285-3 in their draw with St James. Michael Rose took 5-70 for Bridges but they could not get the final wicket to seal the win. Pagham and Worthing also drew. In Division three, Matthew Geffen (5-46) and Daniel Weigl (5-48) bowled Chichester Priory ark to victoory against Crawley Eagles. Bognor produced a brilliant run chase to beat Glynde. Glynde posted 241-5 decalred. Robert Mouland (68) and Archie Burrows (67) top scored. In reply, Mikey Harris (68), Andrew Quincey (68) and Zayne Bux (90*) saw Bognor home by eight wickets. Steve Case took 5-22 for Portslade as they beat Goring by Sea by 50 runs. Haywards Heath and Steyning drew. Alex Crowther (62) and Callum Smith (58) starred in Heath’s total of 247. Steyning finished 223-9 thanks to Hywel Jones’ 78. Jonny Phelps took 6-83 for Heath. Tom Trowbridge was Burgess Hill’s hero as he hit 120 after Rottingdean set a target of 247. The skipper hit 120 in the impressive run chase. In division 4, Mayfield beat Rye by 61 runs with M Pretorius taking 6-47 while Crawley enjoyed a easy 9-wicket win over Slinfold. Southwater beat Henfield by five wickets. Jack Parsons scored 58 and Ben Helps 41 in the Henfield innings while Alex Harding took 5 for 55. In the Southwater innings, Jay Patel scored 41* and Andy Carvell ensured his team’s victory with four sixes and two fours in his 35*. Struan Cameron took 7-51 as Stirlands beat Hellingly by six wickets. William Gubbins (67*) guided Stirlands to the 162 target. Keymer and Hassocks bowled Wisborough Green out for 119 as they won by 59 runs.